Vaughn is an unincorporated community situated on Vaughn Bay in the northwestern Key Peninsula. While it was once an important port, served by steamboats in the late 19th - and early 20th -centuries, today, it’s a tranquil place for watching the boats pass by on Case Inlet, with many homes and vacant lots featuring sweeping vistas of the water, soaring Mount Rainier and some with prime low bank waterfront too. Living or vacationing here, you’ll be surrounding by an astounding array of wildlife, including frequent sightings of orca pods, bald eagles, and seals. Homes on the bay offer some spectacular views not only of the water but of dramatic Mount Rainier looming over the landscape beyond. With the incredible array of wildlife all around, you’ll be able to watch for seals, deer, bald eagles, and even whales, as well as harvest tasty shellfish. Area beaches around the Key Peninsula are popular for shellfish harvesting, which means with Vaughn waterfront real estate you’ll have easy access to tasty free meals. Clams, oysters and clams can often easily to be had just by picking them up off the beach, setting a trap or doing a little digging. While living here means being immersed in stunning scenery and the opportunity for outdoor adventure, you’ll have convenient access to the necessities too, with Vaughn’s Friendly Food Market steps away for limited groceries and light bites. Vaughn waterfront real estate includes some magnificent homes offering the ultimate in waterside living, along with large lots, some with significant acreage for constructing your dream home. 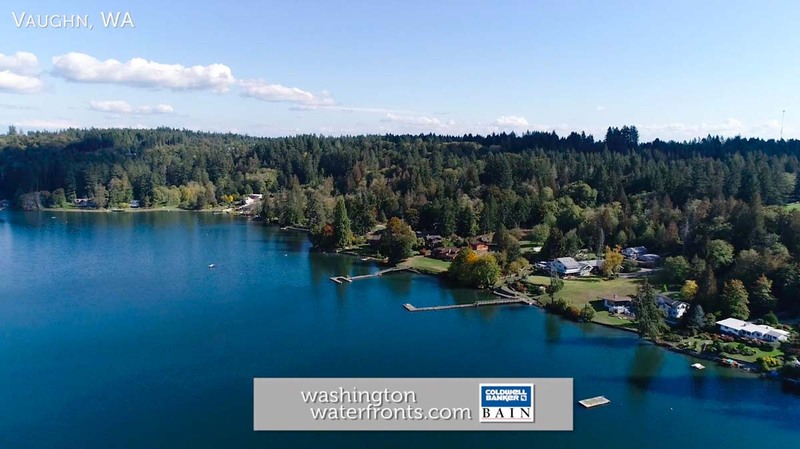 With the picturesque town of Gig Harbor and its wealth of casual and fine dining, shopping and cultural attractions only about 15 miles away, and the city of Tacoma is less than a 40-minute drive away, it’s hard to beat owning property in this slice of Northwest paradise. Take advantage of our industry-leading tools to make your property search as easy as possible and be sure to register for a FREE account so that you can receive email alerts whenever new Vaughn waterfront real estate for sale hits the market. If you're seeking to sell your Vaughn waterfront property, contact our Waterfront Specialists directly for a comprehensive listing analysis and to learn more about the cutting-edge marketing strategies we'll use to sell your home quickly for top dollar!